In this article, I am providing solutions to all the questions of Biology of CBSE Board's X Class question paper of 2018 Main Set-I question paper. This will help the students to learn the technique of writing the answers in a proper and correct way with using exact key words. Answer:- All the pea plants obtained in F1 generation are tall. Answer:- The response of plant parts towards gravity is known as Geo-tropism. 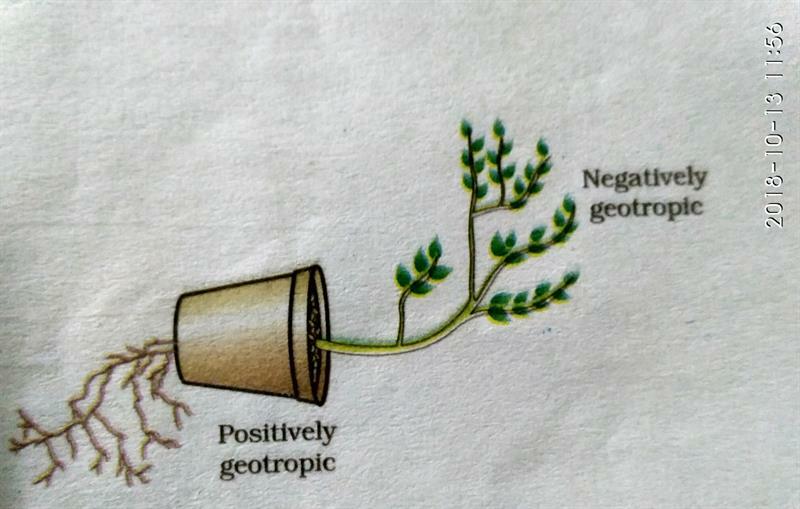 Roots of a plant always grow towards gravity and so roots are said to be positively Geo-tropic. But shoot of a plant always grow away from gravity. So shoot is said to be negatively Geo-tropic. Answer:- Characters that a person acquires during one's life time are known as acquired characters/traits. Such changes do not occur in the reproductive tissues. Changes in the reproductive tissues are not passed on to the DNA of the germ cells and therefore not inherited by the next generation. Question 5. While teaching the chapter "Our Environment" the teacher stressed upon the harmful effects of burning of fossil fuels, plastics, papers etc. The students see the extensive use of plastic and polythene in daily life , which can be avoided and the surroundings can be kept clean. They decided to make their school "plastic and polythene free" and motivated each other for its minimum use. Why should the use of polythene and plastic be reduced in daily life? In what ways the students would have avoided the use of plastic and polythene in their school? Plastic and polythene are non-biodegradable and are not Eco-friendly material. Carry your tiff-in and lunch pack in steel containers. Encourage the students to use cloth bags/jute bags instead of using plastic bags to carry books. By spreading awareness in the form of speeches in morning assemblies, playing skits in the assemblies, Classroom discussions, Display boards etc. Ans. Managing the resources to meet current basic human needs, while preserving the resources for the needs of future generations and maintaining the quality of environment is known as Sustainable Management of Natural Resources. It is necessary to maintain the quality of the environment and also to maintain the continuity of the natural resources. Reuse. Because reuse method ensure prevention of accumulation of waste material in the environment. Write the reaction that occurs when glucose breaks down anaerobically in yeast. Write the mechanism by which fishes breathe in water. Name the balloon like structures present in lungs. List two functions. Fishes take in water through their mouth and forces it through the gills. The dissolved oxygen in water diffuses through the blood capillaries and is then taken into blood. The balloon like structures present in lungs are Alveoli. Alveoli are thin walled membranous structures over which extensive network of thin walled blood capillaries are present. Exchange of respiratory gasses occur over the the large surface area of alveoli of lungs. The respiratory pigment present in RBC is Hemoglobin. Hemoglobin has the ability to combine with O2 as well as CO2. So RBC has the ability to carry O2 from alveoli to tissues and CO2 from cells and tissues to alveoli. Name the process and explain the type of nutrition found in green plants. List the raw materials required for this process. Give the chemical equation for the mentioned process. The process is Photosynthesis. The type of nutrition found in green plants is autotrophic nutrition. In this nutrition the plants can prepare their own food by using water and Co2 in the presence of chlorophyll and Sunlight. Light energy is converted into chemical energy through splitting of water (photolysis step). Hydrogen ions and oxygen are evolved in this step. Finally CO2 is reduced to carbohydrate by using hydrogen ions produced in photolysis step. what is variation? How variations are created in a population? How does the creation of variation in a species promote survival? The small differences which appear among a group of organisms are known as variations. New variations may arise during the process of copying of DNA in reproduction. Variations created in the previous generations will be carried into the new off-springs in every generation. Combining variations of two or more individuals lead to combination of new variations. During the formation of gametes in sexual reproduction, reproductive cells will undergo meiosis cell division. This division results in formation of haploid gametes. But during fertilization when the haploid gametes fuse and it results in restoration of original chromosome number in the off-spring. Question 10. Draw a labelled diagram of the experimental set for the study of liberation of Carbon dioxide gas during respiration. Question 11. Draw diagrams showing reproduction in yeast in proper sequence.